This post explains who we are and how we started. We are not affiliated with any group, political party or industry. We have not received any funding from any outside group or individual – none. 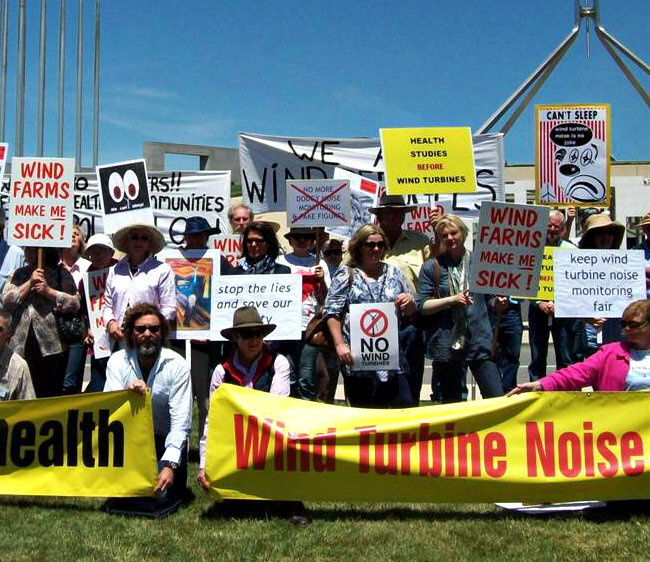 We started as a kitchen table group of citizens concerned about what is happening across rural and regional Australia, by the harm being done by the wind industry, in partnership with governments. Since we began in December 2012, we have added to our concerns the economic and social harm caused by rocketing power prices and unreliable power supplies, the product of heavily subsidised and intermittent wind power: the results that have played out in Australia’s wind power capital, South Australia, will cripple that State at an economic and social level for decades to come. And over that time we have grown to enjoy the valuable input and support from a range of eminent experts, including engineers (some of whom designed and/or built Australia’s power grid), economists, health professionals and lawyers. Our sources also include several Federal MPs and the staff in their offices, as well as community leaders across the Country. We were surprised and alarmed by how quickly the Green movement sold its soul to jump into bed with the wind industry; and floored by how malicious that class of zealots becomes whenever faced with any kind of threat to their beloved wind industry. We are dismayed to see people being forced from their homes due to incessant, wind turbine generated low-frequency noise and infrasound; and horrified as we witnessed those in positions of power not only fail to help those people, but turn on these victims of a government-sanctioned, subsidy-soaked industry. We are angered by the scope of the wind power fraud. We are appalled by how wind industry supporters dismiss victims, ridicule those who have different opinions and vilify those who are opposed to industrial wind power generation. We are appalled by the dishonesty of the wind industry, its supporters and those who operate within it. We are disappointed that the many who claim to have been made sick are segregated and dismissed. STT’s editorial team does not live near wind turbines and their homes are not threatened by wind turbines, so we reject the NIMBY charge often levelled by those who never have to live or work near industrial wind turbines, at the unfortunates who have no choice but to do so. We aim to act as independent but compassionate observers, who have undertaken our own investigations and report on them. We think the direct and adverse impacts from industrial wind power on wind farm neighbours to be an issue of fairness and human rights. 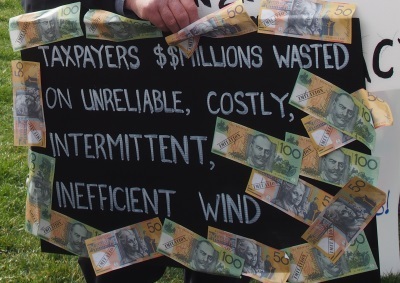 We don’t think the wind industry collectively is a good corporate citizen. We believe this is an industry fueled by the prospect of massive government mandated and subsidised ‘profits’, hiding behind a veneer of “the common good”. We believe wind industry proponents are hell-bent on destroying our environment, while cynically claiming to “save” it. We believe the rampant installation of turbines across this country must be stopped now; and, from the evidence we have gathered since December 2012, we are convinced that industrial wind power does not work on any level: economic; social or environmental. In short, we consider that subsidised wind power is the greatest fraud of all time. I’ve written a short article that explains the increased costs and increased emissions associated with intermittent power generation from wind or solar. Who should I email it to so it can be seen by STT readers? Copy and paste it here and we can post the article. Include any links or images and we can incorporate those. Thanks. Do you have any idea what this company is talking about? Or is it the usual nonsense? $40 million savings in one year on an investment of $150 million is not bad but I cannot for the life of me work out how they would compute the savings. I would be interested in your comments/thoughts. It is twaddle. This analysis explains why. are killing our beautiful birds on a regular basis. Hello, I’m an environmentally concerned individual in Ireland, no vested interests in anything. I feel the main problem with renewables is that they are intermittent, expensive, geographically widespread (land and infrastructure hungry), have toxic by-products during construction and decommission and are simply failing on almost every important particular to be useful or reduce pollution. Batteries would drastically worsen the problems. Its great if wind turbines kill less birds and bats, but if they don’t get significantly cheaper and more useful (I don’t see how they can) then why bother with them at all. Nuclear power is cheaper, more reliable, cleaner and even safer (if you look at deaths per unit of electricity statistics). On Friday 16 March 2018, in a shock move, EPYC withdrew the Jupiter Wind Farm proposal, citing the NSW Department of Planning’s Assessment and that the Independent Planning Commission would agree. The community who have been opposing the wind farm, are surprised by EPYC’s decision, but very relieved. and determination of the application would not have been made fairly and independently of the Department’. Residents Against Jupiter wind turbines (RAJwt) who’ve been formally fighting the proposal for four + years, are both elated at the withdrawal and unsurprised at the developer’s comments. For many years, the Department of Planning has been advising the developer to improve its community consultation processes and be aware of the large number of residents who would be impacted by the proposed wind farm. EPYC seemed oblivious of the suggestions, instead, at Community Consultative Committee meetings, preferring to stonewall community reps critical of the development. At no time did the company officers appear to try to listen to the community. What took them so long? The Department’s Assessment made it clear that the site selected was not suitable for a Wind Farm. There would be an unacceptably high impact on too many residents living near the wind farm. The Jupiter Wind Farm straddles both the Goulburn Mulwaree and the QPRC local council areas. Both councils rejected the proposal, citing the unacceptably high impact on residents. The Australian Wind Alliance opposed it. The affected community opposed it. A record number of submissions were received opposing the wind farm. The community understands that there is always a cost with development, but they also understand the meaning of unacceptable. There was a certain myopia about the principals of the company; they did not seem able to build alliances nor take advice. This is well illustrated by the company’s final letter of acquiescence to the IPC. In the meantime, who will remove the three wind monitoring masts installed by EPYC, located in Manar, Mt Fairy and opposite Roseview? Will EPYC passively leave these things as a reminder to the community that they had the last laugh? Or will they surprise us with hitherto unseen integrity and decommission the masts? Congratulations to our community, so many of whom have fought long and hard, with great unity, to stop the attack on us. Today the NSW Department of Planning and Environment (DPE) knocked back the proposed Jupiter wind farm. EPYC, the wind farm developer, failed to convince the Department that its proposal was a good fit in the largely rural residential environment, south east of Tarago, NSW. This is the first time DPE has recommended against a wind farm proposal, but the breakthrough has only been achieved after years of intensive community agitation. And, it’s not the end of the story. The recommendation will now go before the Planning Assessment Commission to make the final determination. A battle weary community takes new hope and begins the next stage of preparations to take to the PAC. ‘This is just the wrong location. Wind farms do have real impacts and we have to place them to minimise those impacts. We can’t just place them anywhere’. It was the unacceptably high impacts of the proposed turbines, that mobilised the community to support and educate themselves. In 2016 they submitted what the DPE termed an ‘unprecedented’ number of objections (400+) to any wind farm proposal in NSW. Despite this, the developer forged ahead, failing to heed DPE’s repeated warnings about siting and community concerns (advice from a recent GIPAA request), instead showing as one resident said, ‘sneering disregard for the hillbillies who do not support their proposal’. ‘The developer tried to bulldoze the local community and failed. The wind industry wants Jupiter killed. It is making their reputation even worse. It was always a very sick proposal. This is a mercy killing by the Department’. The DPE decision, while only a recommendation to the PAC, is momentous as it does indicate that the Department has weighed up the impacts on the community surrounding the Jupiter Wind Farm proposal. A new era begins. One in which rural communities are given a fair hearing. The Tarago and surrounding communities are celebrating this decision and breathing a sigh of relief after their long David and Goliath battle. Yet again we read of callous disregard by windfarm manufacturers for the health of their workers https://www.desmoinesregister.com/story/money/business/2017/12/16/former-tpi-iowa-workers-claim-they-were-fired-after-chemical-exposure/844600001/ . Some time ago I found this Report https://osha.europa.eu/en/tools-and-publications/occupational-safety-and-health-in-the-wind-energy-sector which documents similar effects and more (see P.32). Lessons have not been learned. The file is pdf and contains one graph only. Add it as a comment as a link and we will consider posting it. You will need to upload the file to another site, eg Facebook. The Irish case settled in favour of the plaintiffs. Terms were agreed, including damages. The terms were confidential. We’ve seen the reports of turbines catching fire and the reports of bird and bat kills. Now comes the reports of subsonic injury to people who live near the turbines. I was wondering, if the subsonic sounds injure people, what do the wind farms at see do to whales and other sea creatures? The activity he refers to has been forbidden by international treaty but not enough citizens are taking a stand on it, or linking it to the “climate” debate, to which it is intimately linked. Journalists from Greece’s SKAI television channel take to task George Adamidis, president of GENOP-DEI, the trade union of the formerly publicly owned but currently under demolition Greek Public Power Corporation, for the views GENOP have expressed on the subject of climate change. The media has construed these positions as meaning that GENOP are allies of Donald Trump. This is the basic message behind the journalists’ ridiculing Adamidis. For English subtitles click white rectangle under the picture. Well done. I was a renewable supporter until I realised I actually knew very little about it, despite having a degree in environmental management, and so decided to research a bit. Suffice to say I’m amazed how naive I was and what a stumbling mess this whole issue is, scientifically and politically. A great site with effective to the point information. I appreciate your efforts and wish you the best. Thanks Philip. Providing information to people like you, who, like us, are truly interested in improved environmental outcomes, and bewildered by the obsession with CO2 gas, is what we aim to do. When it assists in allowing people without a particular view to reach the inevitable conclusion, we like to think we have achieved something. Glad you like the site, we like to think it is making a difference. So what will it be, American/European wind turbines or Russian/Turkish nuclear power stations? Plague or cholera? Hi, My name is Joanna. I am a member of Deep Green Resistance, a group and a movement that is anti industrial methods of generating energy, including wind and solar, being so called ‘green energy’ sources. After the SA announcement of Tesla supported large scale wind farm, I am looking connecting to people around Australia who have investigated the full impact of wind farms on land and people. My aim is to write an article explaining the real costs and impact of wind farms as well as issues of financial subsidies and corruption. Mostly, I would like to learn about this subject and then contribute to presenting alternative views. Would you be open for discussions? If you’re opposed to industrial green energy, what do Deep Greens make of the Green Party Australia, who push it strongly. I hope you’re appalled. Interesting to know of your division. I differ too in that I’m an environmentalist and think generally global warming is a farce and we’d be better to spend the money on stopping pollution of rivers and oceans, buying the amazon, and researching and finding action plans for when oceans do rise, as they will one day, man made climate change or not. That’s all. Does Deep Green Resistance identify with either side of the mainstream “climate change” debate? I have a way of producing CHEAP electricity and i have been trying to get someone to ask me about it – I have not put a patent on my idea YET. I have sent emails to most of the top politicians in the LIBERAL and a few others but have never been asked what is my idea. I would like to speak to Terry McCrann about it as i have just watched him with Peta Credlin. Thank You. Ricardo, if that is so, the world will beat a path to your door. We do not have contact details for either McCrann or Credlin and cannot otherwise help you. Try contacting McCrann at The Australian and Credlin at SkyNews. Pop a link to your report in a comment and we will consider publishing your report. Thanks. We would be happy to do a full post, including the video if you can send us transcript of the address in English. Simply add it to a comment and we will take it from there. Reads like an ABC beat up. The US military have been at odds with the wind industry for years, as have defence forces elsewhere – wind turbines interfere with military radar, seismography (used to monitor nuclear testing) and pilots near wind turbines have recorded near misses on training runs. So Donald Trump denies the existence of the climate? If they mean he resists unsubstantiated theories about a single, naturally occurring trace gas essential for life on earth causing the planet to incinerate before our very eyes, then your President is hardly Robinson Crusoe. This is in reply to the 9.41 p.m. post. There seems to be no provision for a reply after it. We are talking at cross purposes. I am not American. I live in Greece. Most of my friends are in the ecological milieu and have Trump stereotyped as a “climate change sceptic” (i.e. bad). It is confusing for them to see their own climate change true believer viewpoints being defended by high-ranking US military figures, in opposition to Trump. I like seeing stereotypes being exploded and that is why I came to this blog. My name is Wayne Hall. I was born in Australia but have lived for many years in Greece and am vice-president of the Aegina Association of Active Citizens. There have not, as far as I know, been proposals for wind turbines to be installed in Aegina. We see them on the horizon, on the mountaintops of the Peloponnese. But they are not a subject of controversy in Aegina. They do not interfere with our local life. We are told that they generate electric power and like everyone else who does not have to share their environment with them we have formed our attitudes to them from what we see and hear through the virtual reality of the mass media: they are a valuable innovation that is helping Greece overcome its dependence on fossil fuels. They are non polluting, contribute to reducing carbon dioxide emissions and so help to mitigate the threat of global warming. If we hear of opposition to them in other places we attribute this opposition to the “not in my backyard” syndrome, i.e. to selfishness and lack of concern for the welfare of society as a whole. Once we are faced with the prospect of having wind turbines, and particularly large numbers of wind turbines, right next to where we live, we may be forced to look into the situation with more attention. I don’t need to repeat what other speakers here today are saying. The fact is that wind turbines are much better at making money for speculative private interests and providing an ecological figleaf for the privatization and deregulation of electrical generation than they are at generating electricity. Countries such as Germany, which has received praise from ecologists for its promise to phase out nuclear power stations and construct large number of wind parks on land and sea are finding that they do not solve the power problem. Germany is now building a new generation of power stations that burn lignite. China too in six of its provinces has just imposed a ban on the construction of new wind parks. Of all the Australian states, the state of South Australia has progressed furthest in satisfying the criteria of the 2015 Paris Climate Summit, deriving over 40% of its electrical power from “renewables”. It also has the most expensive and most unreliable electricity supply in Australia. Last year, as a result of extreme weather conditions, with torrential rain and very strong winds, all of the electrical power of the state (with the exception of Kangaroo Island) was taken out, in some places for more than 24 hours. “Renewable” energy sources, including wind power, are justified on the basis of the threat of global warming. The devotees of both sides of the mainstream climate debate i.e. on the one hand those who warn against the dangers of global warming, which they attribute mainly to atmospheric emissions of carbon dioxide, and on the other those who assert that the theory of anthropogenic global warming is a fraud, resort to hysteria when they sense that their ideas are under threat. This is an extremely politicized controversy. But the hysteria is in part due to the fact that both sides of the discussion avoid touching taboo subjects. This evasiveness, in the final analysis, makes the discussion unscientific (i.e. irrational). Also, the bipolar hysteria serves the purpose of aligning the public debate with the requirements of the two-party political system of the United States. Today even Americans are trying to emancipate themselves from the divided and ruled mentalities that are spawned by these bipolar arrangements. On the subject of wind energy there are parliamentarians today, such as the Greek-Australian senator from South Australia Nick Xenophon, who are making similar efforts, i.e. efforts to promote an objective and scientific approach to the subject of renewable energy sources. As I said, in my own local environment of Aegina the necessity has not yet emerged for us to take a decision for or against the installation of wind turbines. In relation to other issues, however, which are equally threatening to the values of solidarity, self-respect, protection of basic rights of freedom and justice, such as the extortionate “trade agreements” TTIP and CETA, our council has adopted the courageous policy of entry into the network of resisting municipalities. As with trade, the energy problem cannot be solved through hysteria and capitulation to the demands of warring lobbies whose only concern is short-term profit. Apart from the above reservations about the capacity of wind power to solve the energy problem, in the case of Southern Karystia there are also objections to the degradation of the natural environment from the accumulation of industrial installations for generating electricity within the protected area of Mount Ochi that will also have a detrimental effect on the economic life of the area, that is to say the agricultural economy and tourism. The Aegina Association of Active Citizens greets today’s gathering of the citizens of Karystos municipality and declares solidarity with its just demands. We have Inverenergy looking to put solar in Hardin Co Ohio – Everpower Has closed it’s Bellefontaine office – are they really one and the same under different legal setups???? Sorry, STT can’t help you with that one. Latest news from Europe is that companies providing pumped hydro power in Germany and other countries are trying to sell off or mothball these assets because they are not profitable due to subsidies paid for ‘renewables’. Presumably Turnbull’s project will get renewable subsidies.